Or grow one each in smaller 14cm pots, or dot around the garden. Grow on for 3-4 weeks on receipt. 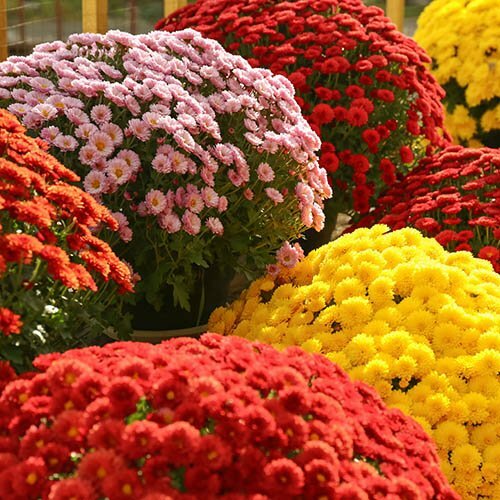 Nothing heralds the arrival of Autumn in the garden than good old-fashioned Chrysanths - and these amazing Hardy Garden 'Mums are just the ticket to fill your garden with colour late on in the season and on into Winter. Naturally dome forming and compact, they will make fabulous potted plants for outdoors, or neat little domes in beds and borders. They will be smothered in literally hundreds and hundreds of flowers in deep, rich Autumnal shades, their filled centres joining together to create a carpet of colour. You will get 3 jumbo plugs each of 6 colours from the Gigi series - Orange, Coral, Pink, Dark Pink, Snow and Yellow - all flowering their socks off from late August well into November. Perfection for the Autumn garden! Supplied as 18 jumbo plugs (2.5 - 3.5cm diameter), 3 each of 6 named varieites, best grown either 1 per 13cm pot, or all 3 the same colour in a 20-25cm pot. Feed and water well in Summer growth - self branching, so no need to pinch again.